Lenovo launches Moto Tab with 10.1-inch FHD display and 7000 mAh battery. Lenovo today announce the launch of a new tablet called Moto Tab. Featuring a 10.1-inch FHD display and powerful Snapdragon 625 processor, the Moto Tab enters a new category of premium devices, exclusively available from AT&T starting Nov. 17. The new Moto Tab features a 10.1-inch FHD display and also has a 7000 mAh battery. Moto Tab comes with a 2.0 GHz Qualcomm Snapdragon 625 Octa-Core processor, featuring 2GB RAM and 32GB storage (plus up to 128GB in additional storage with an optional microSD card, sold separately). 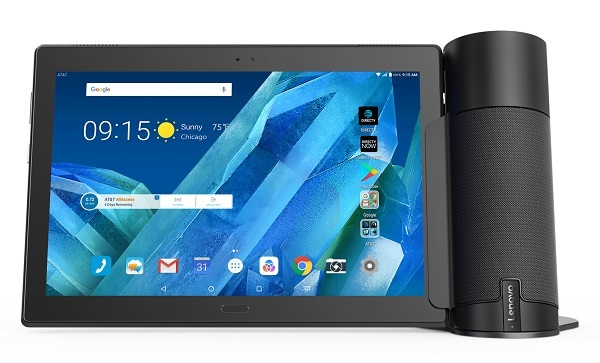 The Moto Tab runs on Android OS 7.1 and Multi-user mode allows parents, teens and young ones to make the Moto Tab their primary tablet device in the home. With Kids Mode you get a dedicated experience where children can only view curated content and approved websites, all controlled from the tablet's built-in parental tools. Fingerprint quick log-in provides simple security for multiple users by allowing up to 7 profiles, and USB Type C capability allows for lightning-fast charge times. You can turn the Moto Tab into your own world of entertainment with TV Mode. Quickly access your favorite shows, movies and content in a single swipe from either the home screen or lock screen, or by tapping the Quick Launch button. Dual speakers and Dolby Atmos will complement your cinematic experience. Starting this Friday, AT&T customers can visit att.com/mototab or an AT&T store to purchase the Moto Tab for $15 a month for 20 months with an AT&T Installment plan, or $299.99 with no contract. + Optional Lenovo Home Assistant Pack, offering a stand with premium dual mics and powerful 3w speaker. Perfect for the kitchen, dorm room or next to the bed. + Optional Lenovo Productivity Pack, offering a Bluetooth ThinkPad keyboard with Touchpad mouse and case folio to work wherever and whenever.